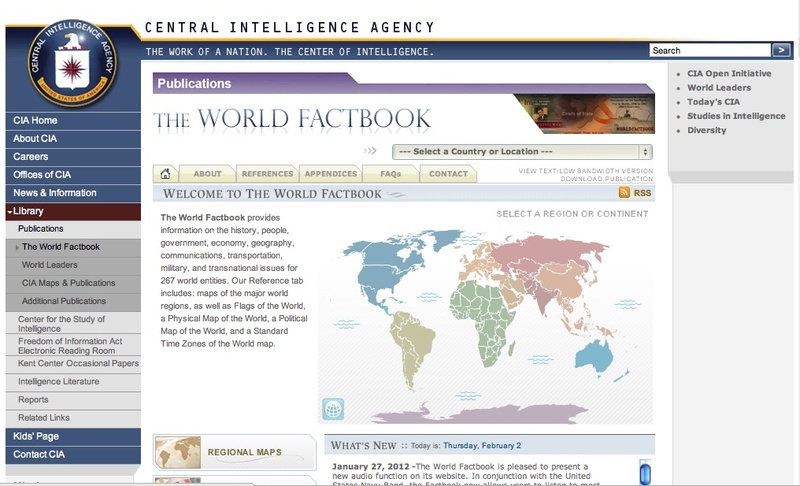 The World Factbook is a publication of the U.S. Central Intelligence Agency (CIA): a concise but comprehensive national-level information and data on countries, territories and dependencies, with maps and detailed information on the geography, people, government, economy, communications, transportation, military, and transnational issues for countries worldwide. The Factbook printed version is an annual publication, but the online version is updated periodically throughout the year. Country reports are in fact updated also thanks to comments, corrections and data sent by users by e-mailing the staff. The section Notes and Definitions provides the policy of the publication about each entry, its meaning, definition and content, so that a methodological explanation of the choices made is available. Only the current version is available online for browsing and simple search on the CIA website. It is also downloadable in zip format, free of charge in its full-text version. This website and its publication offer a good and simple starting point for data research about countries worldwide.